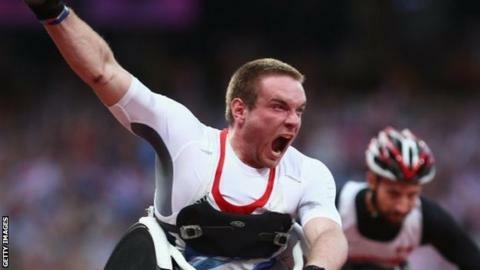 Mickey Bushell blew away the rest of the field to win the T53 100m final at the London Paralympics. The Shropshire wheelchair racer, 21, who won silver in Beijing in 2008, made a brilliant start and powered away to finish in 14.75 seconds, short of his world record time of 14.47. China's Zhao Yufei took silver in 15.09, with compatriot Yu Shiran third. Meanwhile, fellow wheelchair athlete Stephen Osborne, 51, finished fifth in the final of the T51 100m. Osborne, from Kent, only took up athletics in 2011. Bushell's victory was Great Britain's fifth of the athletics competition and a significant improvement on Beijing four years ago, when the team won only two track and field gold medals. "It went better than I expected, I'm really happy with that," said Bushell, who does not have seven vertebrae from the lower part of the back just above the coccyx or tailbone. "It was all about the winning tonight. Training has been going really well the past couple of weeks so I knew I was contender for the gold. The conditions on the day were perfect." Bushell added that he had been "really inspired" by team-mate David Weir's win in the T54 5,000m final. "I was bouncing off the walls in my hotel room," he said.